Troubled handset maker Research in Motion, which just posted another set of bad results, is trapped in an ultra high-risk waiting game. WATERLOO, Ontario ( TheStreet) -- Troubled handset maker Research in Motion ( RIMM, which just suffered through another disappointing quarter, is trapped in an ultra high-risk waiting game. Speaking during his first quarterly conference call since taking the RIM reins, new CEO Thorsten Heins touted the delayed QNX-based BlackBerry 10 product as key to the company's turnaround. "The lack of an LTE product and a high-end consumer offering in this market is hurting our performance," he explained. " The BlackBerry 10 product and platform will address this later this year." The problem, though, is that the BlackBerry 10 will not appear until the second half of 2012, likely sometime in the fall. In the meantime, RIM continues to take a pounding from Apple ( AAPL - Get Report), Google's ( GOOG Android phones, and, increasingly, Microsoft ( MSFT - Get Report) Windows phones. "Until then, things may get ugly," warned Charlie Wolf, an analyst at Needham & Company, in a note released on Friday. "To survive, the company plans to price BlackBerry 7s aggressively, which will translate into lower revenues and gross margins. In short, RIM can effectively write off the next two or three quarters until BlackBerry 10's arrival in the fall." "Until the fall, I don't see too many drivers for RIM," added Ron Gruia, an analyst at Frost & Sullivan, in an email to TheStreet. " RIM is seeing more pressure from the competition: Not just in the high end (Apple) but also in the lower end with compelling LTE devices that cost less (for example, AT&T's ( T $99.99 Lumia 900 or Verizon's ( VZ $79.99 LG Lucid are just two recent examples)." Set against this backdrop, RIM shipped just 11.1 million BlackBerry devices during the fourth quarter, down sequentially from 14.1 million, and 52.3 million in the same period last year. During the conference call, Heins said that RIM will "aggressively incentivize" payers of BlackBerry 7 smartphones, but acknowledged that the next few quarters will be challenging for the company. With RIM clearly on the ropes, the CEO promised "substantial change" such as refocusing the RIM's enterprise efforts. Heins also explained that RIM needs to "learn how to partner," as well as boost efficiency in its supply chain and production processes. Analysts, however, warn that rebound efforts may be too little, too late. "BlackBerry 7 products are showing little market traction and the prospects for BlackBerry 10 remain uncertain," explained Stuart Jeffrey, an analyst at Nomura Equity Research, in a note released on Friday. "We see little likelihood of RIM succeeding as a standalone ecosystem, even if it does find some partners." Nomura, which has a neutral rating on RIM, lowered its price target from $15 to $13.25. "We believe BlackBerry 10 smartphones will launch into an even more competitive smartphone market, as we anticipate continued innovative new Android LTE smartphones, an increase in Windows smartphone offerings from Nokia ( NOK and other OEMs, and a refreshed LTE iPhone 5," added Michael Walkley, an analyst at Canaccord Genuity, in a note. "As such, we have modest BlackBerry 10 sales estimates." Canaccord has a hold rating on RIM and lowered its price target from $15 to $12. Investors have been fleeing RIM in droves over the last 12 months, pushing the company's stock down more than 75%. Apple's stock, in contrast, has climbed more than 73% over the same period. 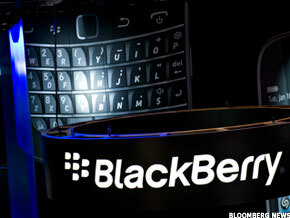 Despite the company's ongoing woes, however, RIM shares rose 45 cents, or 3.35%, to reach $14.18 on Friday.